The lace-up trend is one of my favorites for 2016. It’s a simple detail that adds so much to a top or dress. I’ve been wanting to make a lace-up dress for ages, and finally am now getting around to it. I picked up this super light chambray at Jo-Ann’s earlier this year and have been waiting for an excuse to use it. It’s such a light, summery fabric, so it was perfect for this summer dress. 4. With right sides together, sew your dress from the end of the sleeve to the bottom of the dress, matching up the seams at the armpit. Then cut a slit down the center of the neckline. My slit was about 5” long — you can do shorter or longer depending on your preference. 6. 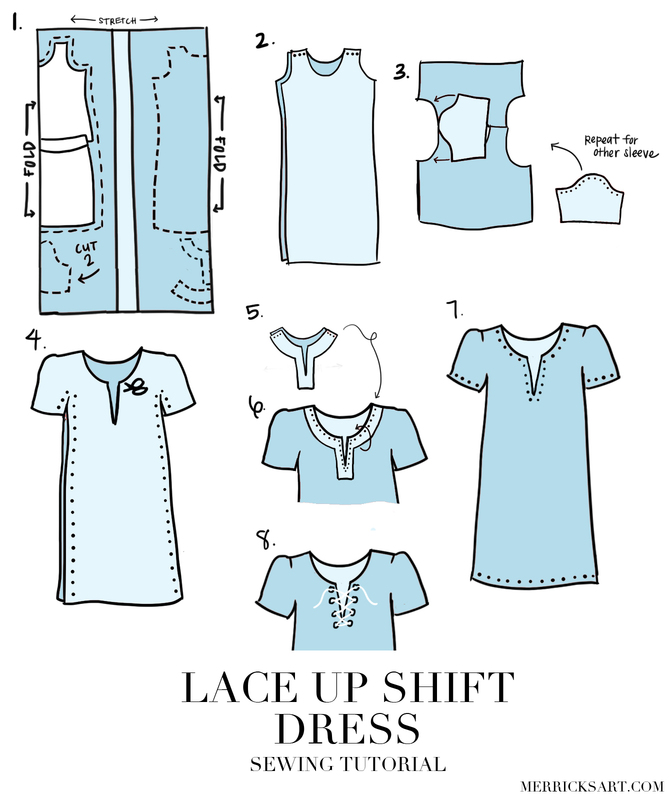 Sew around your neckline, attaching the NECKLINE LINING. When you get to the slit, sew down the sides of the slit and bring your stitches to a point at the bottom. You can see a picture of what I’m talking about in this blog post here. 8. Insert the eyelets using the instructions on the packaging. I used this tool to insert them. Then lace it up and you’re done! Super cute! Thanks for sharing yet another amazing DIY with us! Can you use a shift dress to make the pattern rather than a tank top/ pencil skirt combo? I’m new to doing my own patterns. Thanks!